Su desarrollo empezó en 1948. En 1952 se ordenó fabricar 300 vehículos para la Guerra de Corea. El tanque se llamó M103. M103 replaced the T34 as the tier 9 heavy in patch 0.7.2. The fully upgraded 120mm cannon is a fantastic gun, with great accuracy, and very high penetration. While it lacks alpha damage compared to the IS-8 or E-75, the gun's reload speed makes up for its lack of damage. 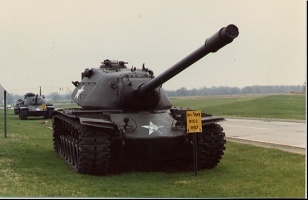 The M103's oddly shaped hull and well-sloped turret can make this tank a bit tricky to fight, especially at long ranges; however, this tank suffers from having very weak sides and rear armor. When fighting this tank from the front, make sure you try and hit the lower armor plating as hitting the upper hull will most likely bounce. If you can only see the turret aim for the large cupola on the top of the tank for easy penetrations. The speed and maneuverability of this tank are quite good, so it's able to keep up with the rest of the team and provide excellent fire support when needed, and is able to turn its frontal hull towards the enemy quickly to reduce damage taken from incoming fire. Highly sloped frontal armor and strong mantlet. Good accuracy, aim time, penetration, and rate of fire on top 120mm. Ammo rack is located on the sides of the hull and is easily damaged even from the front. Turret cheeks and cupola are weak. Not a hull-down monster like T29 or T32. Mobility, penetration, and rate of fire are this tank's strongest attributes, it is recommended to stay with other tanks when advancing, as its lack of overall armor makes it easy to damage. Stay artillery safe whenever you are not in motion, as artillery often will target hulldown tanks which otherwise would be hard to kill. Also avoid exposing your hull as the glacis plate is extremely easy to hit and penetrate. The turret ring, while hard to hit, is also easy to damage. The M103 plays more like a very heavy medium than as a heavy tank. Players should try to flank heavier targets and support stronger heavies such as the E-75 and VK 45.02 (P) Ausf. B when possible. One area of superiority when dealing with other tier 9 heavies is reload; the M103 has best in class reload and can frequently get two shots in against one from the enemy. Next you should get the engine, as it gives the tank much better mobility. After that you can decide if you want to get the top 120mm gun or to save the 60,000 XP for the T110E5 to get it sooner. The 120mm slightly upgrades rate of fire, penetration, aim time, and accuracy. The radio does not have priority but it is relatively cheap to research. The stock tracks allow mounting all upgraded modules, so you can wait to upgrade these if you prefer.